Trailers for the season-ending episodes, beginning with “Sabotage,” promised that this arc would put more emphasis on Ahsoka than any other this season. 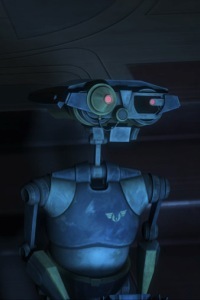 “Sabotage” pulls some punches, but corrects a lot of The Clone Wars’ shortcomings in setting up an arc. I admit I slung that loaded phrase “Mary Sue” at Ahsoka when she first appeared five years ago. The most unbiased definition of the term is “a young woman so over-powerful as to cast the realism of the story in doubt.” I thought it fit Ahsoka initially because while taking on everything from droid soldiers to the barely-mentioned akul beast as a teenager, she also was usually rewarded for traits such as arrogance and hot-headedness that should have been seen as flaws. I felt that the show was pushing her at me asking me to love her, and I didn’t like being told what to think of her. For a while, Ahsoka also didn’t have much character development. Her inner life has largely been skimmed over in The Clone Wars, more than I would expect from a main character. Her trip to the dark side was in essence all a dream. We never saw her learn to wield two lightsabers, a rare technique. 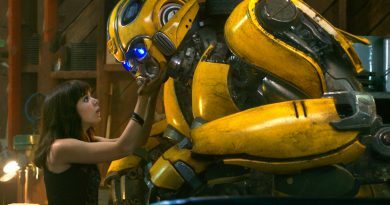 Her love interest never had much chemistry with her, and seems to have largely been forgotten after a series of meaningful stares. Lux left her twice – once floating in space and once for Steela – and Ahsoka hasn’t had much, if anything, to say about it. This problem can arise with male characters too, though; Beck from Tron: Uprising comes to mind as someone who goes from a civilian to a superhero without fear and with little comment in between. So I had some baggage with Ahsoka that I hoped could be dropped. In Season Five she seems to be catching up with herself. She taught young Padawans in “The Gathering” and trained guerilla fighters in the Onderon arc. It makes sense for her to be capable after several years of training with Anakin, Obi-Wan, Padmé, Yoda, and others. She’s still not my favorite character, but I can believe in her now. In “Sabotage” Ahsoka is still insufferably self-righteous, but then again she probably learned that from Anakin. At least he notices: “You always have it easy, Snips.” On the other hand, it can’t be a bad thing to show a teenage girl as a strong person, and Ahsoka certainly is that. In a pretty funny moment at the beginning, she also nearly falls over right before her successful rescue of Anakin. She’s a good partner in crime-solving for Anakin, and she’s grown into her confidence in an increasingly appropriate way. On the technical side, I like how the animators pay attention to the movements of her beaded jewelry and headtails. 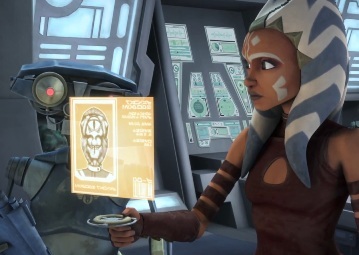 But Ahsoka is still precocious: she’s better at forensics than the droid designed for it, and she doesn’t have much personality besides being capable and occasionally gawking at things. The other female character in “Sabotage” is Letta Turmond, who fakes being clueless about her (cross-species) husband’s involvement in the titular crime. I admit I didn’t see her deception coming. Her crime is heinous, and there’s a bit of horror in the idea that a character unknowingly ate something that then exploded inside him. I’d like to know more about her and her motive. Mace suggests she hates the Jedi, but not why. With Letta in Jedi custody at the end of the episode, hopefully we’ll learn more in the next one. “Sabotage” pays more attention to the Force’s non-martial uses than most. “I can still hear the screams” is one of the better lines – a creepy acknowledgement that Anakin can sense a Force-echo of the attack. His scrunched-up face at the end of the scene reinforces that he’s not happy. In fact, Anakin is by far the most perceptive person in the episode, talking often about what he feels in the Force. The dialogue in the episode is smoother than usual. The animation is gorgeous and textured, really making the world feel real. The fading paint and graffiti in the underbelly of Coruscant was great detail. It’s amazing to look at how the light moves in characters’ eyes. There’s also some really appropriate and emotional music in this episode, from sad piano to exciting chase scenes. I tend to like episodes set in single locations, because it means we get to see many different sides of that location. The Jedi Temple is that location here, and we get to see from the hanger up to the Council chamber, including medical wards, hallways, and a holding cell that looks pretty inhospitable for someone who isn’t technically a prisoner. I also liked the appearance of Cin Drallig, the Jedi Master named after and played in Episode III by fight coordinator Nick Gillard. Drallig only has a few lines and brief screen time, but he sounded enough like Gillard to make me happy. Barriss Offee and Tera Sinube also make background appearances. There was a nice namedrop of General Krell, as well. I’m glad the show is acknowledging its own continuity more often the last couple of arcs. There’s also a droid, an investigator named Russo, but I think I reached my quota of paying attention to droids with personalities for this season. At least this one’s not too quirky, and his little assistants had a cute moment where they turned their heads before turning their bodies. “Sabotage” has some moral questions to unpack, but seems reluctant to agree with the Coruscant civilians instead of the Jedi. Anakin notes that an idealist can become a traitor, with no sympathy for that person: he’s loyal to the Republic and its flawed ways through and through, a little hint in the direction of his becoming Vader through Palpatine. Ahsoka is also immediately against the suggestion of the Republic bringing police into the Temple to investigate, yelling “They can’t do that!” The Council does get some ominous music, like we’re not quite supposed to be rooting for them. Ultimately, though, the Jedi aren’t shown as being guilty of any of the things the citizens accuse them of. At the end, Anakin is still convinced he’s a good Jedi, which is ominous in itself. The episode I thought I was watching in the trailer was far more interesting than “Sabotage” actually was most of the time. I’d hoped that Ahsoka was going to be framed for the attack in this episode, and maybe that comes later. As is, the episode is a straight mystery, with an uninteresting antagonist and Ahsoka not learning much. “This war is becoming less and less popular,” said Mace, and we can see why here. But the Jedi are not actually at fault, and keeping them blameless seems like the easy way out. “Sabotage” pulls its punches in places. Russo warns that the Jedi Temple workers might be angry at the Jedi, but when Ahsoka meets one he doesn’t actually act angry or scared toward her. He wonders whether the Jedi were behind the attack but doesn’t seem upset, and doesn’t direct his fears at Ahsoka personally at all. And Letta isn’t a Temple worker. She appears to be fighting for one, though. Ahsoka does confront Letta, and Anakin threatens Letta in a way that certainly isn’t Zen, so there is a little bit of moral grayness present. Letta never speaks about her motive. 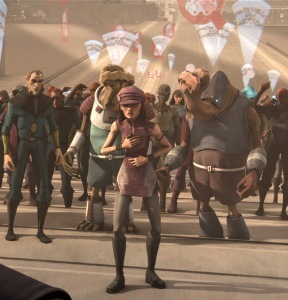 She attends the anti-Jedi rally, but that could be because she indirectly started it. The episode would have hit a lot harder for me if the Jedi had actually committed a crime, or even if there was more emphasis on their past misdeeds. Instead, the only place where we see the Jedi at fault is when Ahsoka notes that Temple workers aren’t paid well. Ahsoka also says “I don’t know how I would have felt” if it had been a Jedi behind the attack, and I hope that’s foreshadowing. The arc has three more episodes, and there are hints that Letta might continue to be the villain, but I would have liked to have gotten further into the meat of the arc in the first episode. Sometimes I judge an episode by how much discussion I can get out of it, and I have a feeling this one will create a lot of talk. 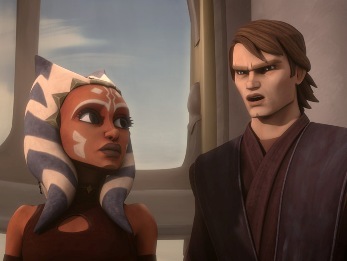 Maybe it will be revealed later that “Sabotage” is more morally difficult than it appears – and I’m starting to wonder about the day when Ahsoka realizes Anakin is one of the “Jedi who disappoint us” he mentions. A lot has certainly been set up, both for the rest of the arc and for the steadily narrowing gap between The Clone Wars and Revenge of the Sith.